India’s cow protection movement is hurting farmers and herders across religious and social lines, according to a new report by the international non-governmental organisation Human Rights Watch released February 19, 2019. Since 2014, when the Bharatiya Janata Party (BJP) took over at the Centre, the growth of beef and leather exports, in which India plays a key role in the international market, has nearly come to a halt. This has affected India’s foreign currency reserves, the report states from an analysis of data from the commerce and industry ministry from 2010-11 to 2017-2018. Between 2010 and 2018, India reported 123 attacks of cow-related hate violence--98% of these after Prime Minister Narendra Modi’s BJP government assumed power at the Centre, according to the FactChecker.in database that tracks such crimes. The Human Rights Watch report relies on this database, along with some others. Many Hindus consider the cow sacred, and 99.38% Indians now live under cow-protection laws, as IndiaSpend reported on April 14, 2017. In February 2019, the central government announced a national commission for cow protection. “These policies and the vigilante attacks have disrupted India’s cattle trade and the rural agricultural economy, as well as leather and meat export industries that are linked to farming and dairy sectors,” the Human Rights Watch says. India is the largest exporter of beef in the world, exporting buffalo meat worth $4 billion a year. However, since 2014, exports have mostly declined. Policies of the Yogi Adityanath-led BJP state government in Uttar Pradesh, India’s top meat-producing state, have led to further uncertainties over the future of the trade, the report observes. In 2014-15, India registered $4.78 billion worth of buffalo beef exports--the highest since 2010--although growth declined by 26.05 percentage points from 35.93% in 2013-14 to 9.88% in 2014-15. Thereafter, the quantum of exports has hovered around $4 billion, declining 3.93% in 2016-17 and growing by a smaller 3.06% in 2017-18. Similarly, India accounts for 13% of the world’s leather. The industry records an annual revenue of more than $12 billion, 48% of which is from exports ($5.7 billion), and provides employment to about 3 million, 30% of them women. In 2017, the government identified the apparel and leather sector as globally competitive and “eminently suitable” for generating jobs for growth. At the same time, a government survey admitted that “despite having a large cattle population, India’s share of cattle leather exports is low and declining due to limited availability of cattle for slaughter in India”. Fear of cow vigilantes and shutdown of hundreds of slaughter houses has led to disruption in the availability of cattle hides, the report says. While export of leather and leather products grew by more than 18% in 2013-14 and 9% in 2014-15, growth declined by nearly 20 percentage points to -9.86% in 2015-16. It grew again but at a much smaller rate of 1.4% in 2017-18, the report says from its analysis of government data. “Hindutva leaders who are promoting this obsession with cows don’t realize how much loss they are causing to their own Hindu community, and damage they are causing to their country,” said M. L. Parihar, a Rajasthan-based author and expert on animal husbandry, quoted in the report. In recent years, several BJP-ruled states have adopted stricter laws and policies that disproportionately harm minority communities, the report observes. The attacks, often by groups claiming links to militant outfits linked to the BJP, largely target Muslim, Dalit or Adivasi (indigenous) communities. Dalits, customarily responsible for disposal of cattle carcasses and skin for leather goods, and Muslims, the traditional managers of slaughterhouses and meat shops, are disproportionately affected by attacks carried out in the name of cow protection, the report notes. Among victims of such violence, the Muslims and Dalits account for 56% and 10% of those attacked, while Hindus comprise 9% of victims, according to the FactChecker.in database. Muslims, particularly, account for 78% of those killed in such attacks, FactChecker.in shows. The inadequate response from the authorities to these attacks is hurting communities, including Hindus, whose livelihoods are linked to livestock, the report says. This includes farmers, herders, cattle transporters, meat traders and leather workers. Nearly 55% of India’s population is engaged in agriculture and associated activities, contributing 17% of the country’s gross value added. India, the world’s largest milk producer, is home to about 190 million cattle and 108 million buffaloes. Farmers maintain and trade this livestock to supplement their incomes and food requirements. But growing violence over cow protection appears to have contributed to a significant decrease in the number of animals traded at government-organized cattle fairs, the report says. For example, the Rajasthan state government organises 10 cattle fairs annually. In 2010-11, more than 56,000 cows and bulls were brought to these fairs and more than 31,000 were sold. In 2016-17, 11,000 cattle were brought and less than 3,000 sold, the report says. With the growing mechanisation of agriculture and the ageing of cattle, farmers are forced to abandon cows because they cannot afford the costs of maintaining them, the report says. 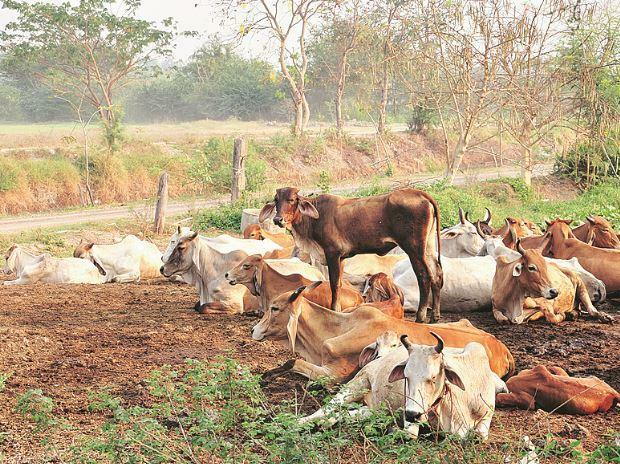 This had led to a rise in the numbers of stray cattle, endangering farmers’ crops. Counter-measures by state governments to curb damage are in turn compromising efforts aimed at improving health and education outcomes, the report observes. India is party to core international human rights law treaties that prohibit discrimination based on race, ethnicity or religion, and require governments to provide all citizens with equal protection under law, the report points out.